These Pancakes are Gluten free, Grains Free, Eggs Free, Dairy Free and Nuts free. Try this and let me know what you think. * Note; you can substitute coconut flour with plantain flour but the resulting pancakes will be dark. Note: some might like it a bit sweeter, so you either use few drops of your own brew of stevia, or alternatively use few from Sweetleaf liquid stevia. Leave for another 4 minutes then drag them onto your serving plate. 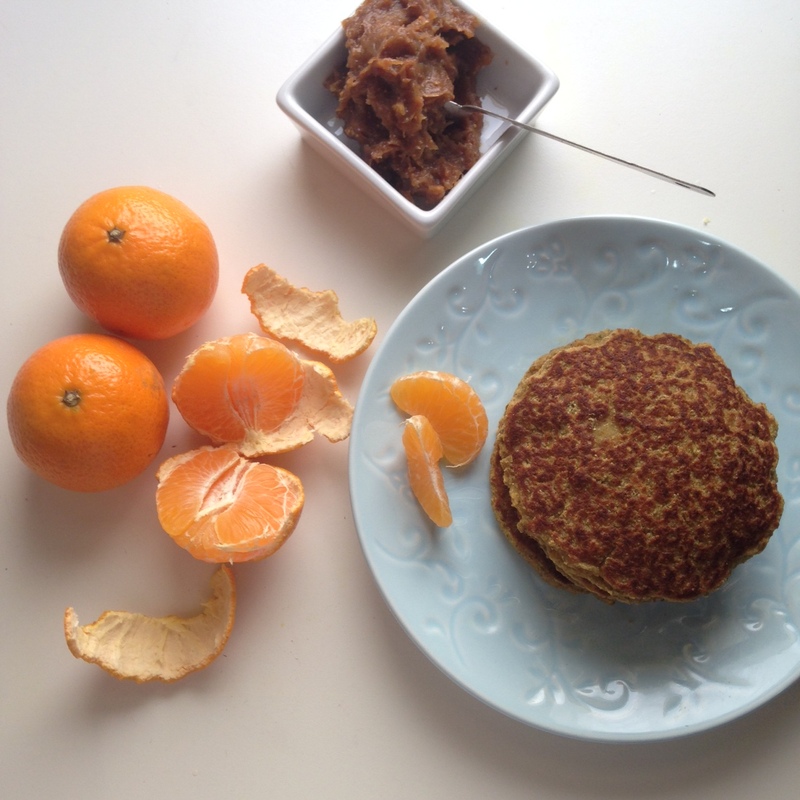 I like the idea of eating this fragrantly sweet pancake with tangerines, oranges or sweet lemons. Just heat some of that fig and dates spread that I made (check my recipe post on Instagram account @caveboy_grubs for that post) and smear a bit of my fig and date spread a bit on top or between layers and savor these exquisite clean and refreshing flavors. الوصفة هذي هي الطريقة النباتية لعمل البان كيك. عمل البان كيك بدون طحين ممكن يكون سهل الى حد ما لكن عمله من غير بيض! هذا اللي كان صعب خصوصا اني مو مستخدم بدائل البيض النباتيه لأنها تحتوي على الصويا أو طحين الذرة او طحين البطاط .. و هذا اللي يخلي العملية شوي يبيلها صبر لأن النتيجه هي عبارة عن بان كيك لذيذ و صحي جدا يكاد يكون خالي من المواد اللي تسبب حساسيات. اذا ما نفعت من أول مرة كرروها لأنها بالفعل تسوى خصوصا ان مافيها مسكرات بعد. ننقل البان كيك على شبك لكي يبرد قليلا . عندما يبرد نقوم بمسح القليل من كريمة التمر و التين الساخنه على الوجه و تناول البان كيك مع أي نوع من الحمضيات سواء يوسفي او برتقال أو ليمون هندي حلو. I love that you are sharing your recipes here! This one is very interesting. I have one question about coconut flour, does it rely on the arrow root flour to become less floppy and more stable? I tried it without as I couldn’t find any at the time and the mixture was spongy and wouldn’t cook all the way through on the grill.